The Central American Tapir (Tapirus bairdii) is a species of concern belonging in the species group "mammals" and found in the following area(s): Southern Mexico to Colombia and Ecuador. 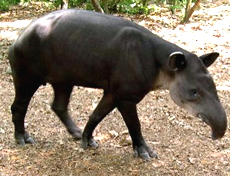 This species is also known by the following name(s): Baird's Tapir. Copyright Notice: This article is licensed under the GNU Free Documentation License. It uses material from the Wikipedia article "Baird's tapir". Glenn, C. R. 2006. "Earth's Endangered Creatures - Central American Tapir Facts" (Online) - Licensed article from Wikipedia: The Free Encyclopedia. Accessed 4/22/2019 at http://earthsendangered.com/profile.asp?sp=444&ID=5. Need more Central American Tapir facts? 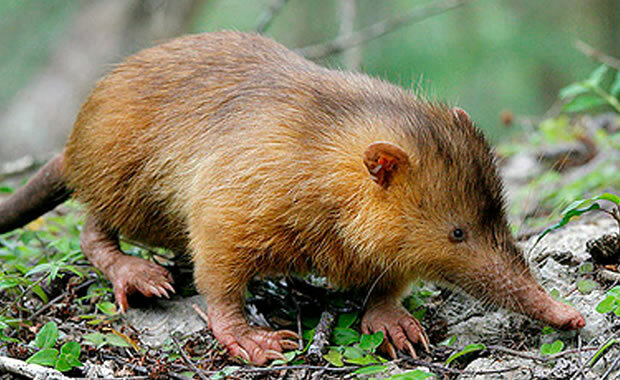 The solenodon is a mammal found primarily in Cuba and Hispanola. The species was thought to be extinct until scientists found a few still alive in 2003. Solenodons only prefer to come out at night. They eat primarily insects and they are one of the few mammal species that are venomous, delivering a very powerful toxin. Symptoms of a solenodon bite are very similar to a snake bite, including swelling and severe pain, lasting several days.